Oregon is on fire. Fires have names. “Kitten” (innocent sounding, for such a nasty fire). “Black Butte” (sounds more like the fire it was…off a butte, down in a canyon, burning in between lava rocks). I never knew lava would burn (of course, the lava isn’t burning, but the vegetation that is in between the rocks does. Brogan (I always think of my Grandad’s shoes), Juniper (now there’s a fire name that sounds like an “out west” fire name should sound). In the past two days we have flown a lot. 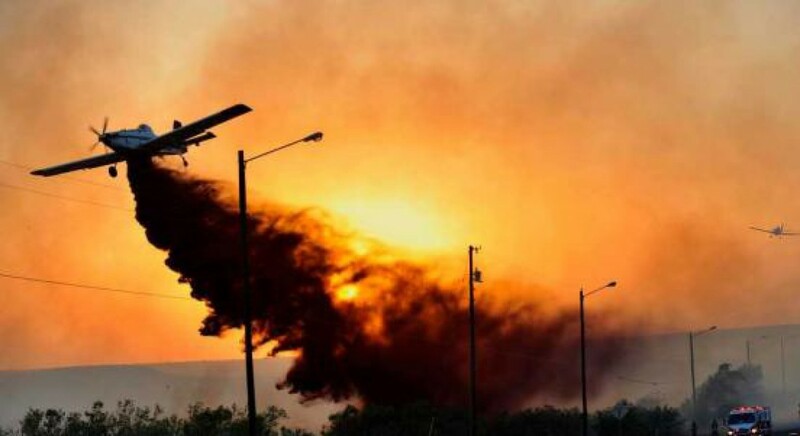 All of the above fires have had repetitive visits from SEATs (Single Engine Air Tankers). I finally had enough drops over and over from the same base, in the same plane, to start to get the rhythm of the operation. I had done drops before the past two days, but not the repetitive cycling that leads to improved competency. Each base has it’s own personality, it’s own routine, and a disadvantage of being the “relief guy” is that each time you get the routine down, you get moved to the next plane for relief. So, you have a new base, a new plane, and a new geographic area to learn. And, it is imperative to get oriented immediately. The daily routine has become, well….routine. “Show time” (the time to arrive at the base) here is usually 0800, other bases usually are at 0900. The plane has to be preflighted, oil checked, and if a new plane (new to me) I have to set up the cockpit. Rudder pedals are critical…too much travel, and you can’t put that jab of rudder in at the right moment to keep the big taildragger straight, too little travel and your feet are cramped up and you are miserable. I’ve learned to check the radios. Even though our company planes are well standardized, a couple of them have “secret switches” on the radios, and it’s mandatory to make sure they’ll work. I had the “learning experience” of getting dispatched on a fire, got in a “new to me” plane, and loaded, ready to take off….and I couldn’t make the radios work. Finally found the switch, all went well, but there were a few minutes of embarrassing silence. Morning brief is highly variable. Sometimes it’s really brief (“today, same as yesterday. Any questions?”) Sometimes, it’s excruciating, sort of like “death by power point”. The briefer will read sheet after sheet of paper printed out from the USFS, BLM, BIA, NOAA, and they’ll have much of the same information. Here the briefing is done by one of the Fire Incident Commanders, and it’s highly professional, with enough detail to know what to expect for the day, know where the new TFR (Temporary Flight Restrictions) are, and any other issues. Then, it’s highly variable. The past two days, we almost immediately got a dispatch. Today, and many other days, we sit in the ready room, reading, writing, doing our paperwork, and being ready to go. Once the dispatch is received, we put on our flight suits, head to the planes, and start. Lining up for our loads, we get clearance in and out of the “pit”, and then taxi for takeoff. Once in the air, get “cleaned up”, and then call dispatch. “Burns dispatch, Tanker 892 on Direct, off Burns, enroute to Black Butte. 3 hours and 30 minutes of fuel, 18 minutes enroute, one SOB”. Those of us who trained “back in the old days”, still say “SOB” for “souls on board”. There are days when we really mean it. Dispatch calls back with confirmation of AFF (automated flight following), an we’re off to the fire. AFF eliminates the requirement for 15 minute check-ins, and reduces the amount of radio traffic on the frequency. The mighty 802 pulls along, and soon we’re into cooler air, and the scenery rolls by at a stately pace. Those are the minutes that soothe those of us that have a pilot soul. Soon it is time to check in with the “Air Attack”. Air Attack (officially known as ATGS), orbits over the fire, communicates with the ground forces, coordinates the helicopters, the SEATs, and the heavy air tankers. He (it’s almost always a “he”), coordinates with dispatch, and sometimes “sells us” to another fire that has a greater need. More than once this summer I’ve been enroute to one fire, and suddenly I get diverted to another one. “Black Butte Air Attack, Tanker 892, 15 miles out”. “Hi 892. Altimeter 30.02, come in at 6000, we’re at 7500, helicopter at 4500, another SEAT at 5000”. “892 copies 6000, 3002”. I motor on towards the fire. The column of smoke has been visible for some time, and now I can see the flames. The butte is quite pretty, the fire has burned along the “drainage” (the common descriptor for terrain that falls away…where water would drain), and is among the lava rocks. I watch the prior SEAT make a drop, a nice line of retardant “tying in” with my prior drop. I still see no ground forces. This is going to be cool. The butte edge is flat (always making life easier…the day prior I had dropped on the fire dropping over the edge of the butte at about 10 feet, pushing over and going straight downhill toward the fire). I set the computer for a coverage level 1, and put it on “pilot control”. Much of the time we set the computer for a known amount to drop, and just push the switch, and the computer controls the rate and the gallonage. I drop in along the edge of the butte, and fly along dropping retardant. I call off the fire, and look as I turn out to head for the “load and return”. Nice! One of my best drops. I’m still learning how to adjust for wind drift, and I was hoping that I hadn’t let my load drift off the edge of the cliff…wouldn’t do much good there. I was rewarded with a nice pretty line along the edge. I call in to dispatch, let them know my estimated time back to base, and settle in for the flight back. The 802, carrying nothing but me, fuel, and itself, feels happy and light. I relax, take in the scenery, look over all the instruments, and then do a quick estimate on my next load calculation. Prior to each load, we have to know the pressure altitude, the temperature, our fuel load, and the gallons of retardant. We plug all that in, and make sure our performance, weight, and allowable takeoff weight are all acceptable. I’ve learned to do as much of that as possible prior to landing, because the turnarounds can be quick. Arriving back at base, a quick call to dispatch to let them know “landing assured”, call base, tell them “load and return”, then announce position on Unicom. I land, taxi in, and pull up to the loading hose. My driver/loader, David, offers me water each time. I’ve learned…don’t drink too much water. We get another 750 gallons loaded, and the process repeats. Yesterday we flew 4.1 hours, the day before flew 6.4 hours. “Pumpkin time” is the hour beyond which we are not allowed to fly. If we should fly beyond that, bureaucratic heads will spin. We have to calculate where we’re headed, how long it will take, and make sure that we have enough time prior to “pumpkin”. The worst part of the day is when we have to quit.